We approached each other with nervous excitement in a grey government building hallway; three young women about to embark on an adventure of reconciliatory proportions. It was day 1 of work with the 4Rs Youth Movement for Nikeeta and I, and we had been invited to a week-long orientation that began in circle at Dodem Kanonhsa, an astonishingly beautiful lodge used for community education hidden high up in the clouds at a busy intersection in midtown Toronto. With all the details of beginning a new job – documents to pre-read and forms to complete – it hadn’t escaped me that there was something uniquely grounded about this particular onboarding process. We would spend the week meeting key players in the work of the movement. We would participate in building a wiigiwaam with one of our national partners. And we had been asked to bring in an item that represented reconciliation to us. It was not the first time we had been asked to talk about what reconciliation means, nor would it be the last. Now, put yourself in my shoes for a moment and scan the room you are in or visit your home in your mind. If you had to select an object to represent reconciliation, what would you choose? Would it be something from the natural world? Would it be something handmade? Through the 4Rs Framework for Cross-Cultural Dialogue and approach, representation and embodiment is a key methodology for learning, as it makes the invisible visible and, very often, the intangible concrete. Let me be honest in saying that I struggled with this task. How to distill such a vast and complex (and problematic) concept into a thing? The more I thought about the task, the more the ‘answer’ eluded me. But as I turned my attention to other things, my heart revisited the question and chose for me: a photo. Pinned by a magnet to my refrigerator door, this image captured a moment in time in my friend’s milpa (a mixed vegetable plot in King City grown in the traditional Mexica Indigenous way). The photo depicted the three sisters crops growing synergistically: corn, beans, and squash, a magically symbiotic trio that together enhance the health and viability of one another and the soils in which they grow. Corn grows tall and strong reaching highest toward the sun. Beans grow up the corn, which behaves as a trellis. While corn requires many nutrients from the earth to become its fullest self, beans help to fix nitrogen and other important nutrients back into the soil. Squash forms the base of the tripod, helping with water retention and preferring the cool and shadier spot nearest the ground. As I sat in circle with my new colleagues that first day of work, I pulled out my humble photo and summoned my courage to speak to its symbolism. Reconciliation is a process of becoming, I said, which is a part of a cycle of growth, mutualism, and renewal. It is about coming together across difference to create a stronger future. 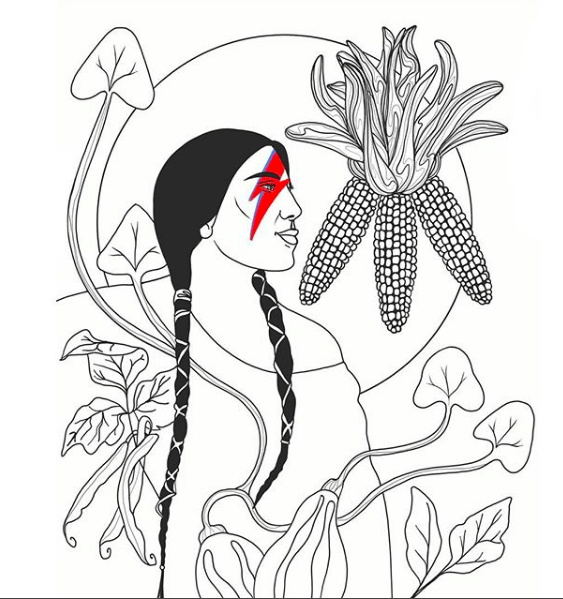 I spoke to the parallels between Indigenous intercropping practices in different parts of the world and how the three sisters are grown together across Turtle Island. I sang my gratitudes and respects for Indigenous wisdom, knowledge, and experience, which carries incredible strength and resilience from the fundamental recognition of relationship at the core of all things. It is this way of knowing that must be centred and upheld in all our reconciliation practices. More than a year later, deep into the work of 4Rs, I have learned and unlearned an abundance that has added to the layers of my metaphor about the three sisters. It is not lost on me that my colleagues have become my sisters, as we hold one another up to grow to our fullest capacities, each in our beautiful uniqueness. We often refer to our work as occurring within an ecosystem, referring to the people, activities, and relationships all around us. At times this metaphorical environment in which we operate is healthy and supportive to our growth. At other times, it feels as though we are wrapping our green tendrils around encroaching pipelines, and we feel challenged by the systems at play all around us as we work to honour earth time, cyclical rhythms, and prioritize the things that really matter: our respectful relationships. As a settler and descendent of displaced peoples living on stolen land, I strive to understand my histories and identities in context of a global story of colonization and forced migration and in relation to the places where I now root myself. I try to stand still in my place to listen and notice how the world around me is shifting and changing. I feel the erratic weather challenging and stimulating my sense of purpose as a core motivation within the reconciliation dialogue, the way the three sisters might under the beating sun of the hottest July day on record. I know in my bones that the reconciliation narrative needs some time in the compost heap after an emotionally exhausting year for so many Indigenous people, communities, organizations, and land and water protectors working hard to stoke the heartfires of resistance against an erasing year of Canada150 celebrations and the recently devastating verdicts for Colton Boushie and Tina Fontaine and their families. 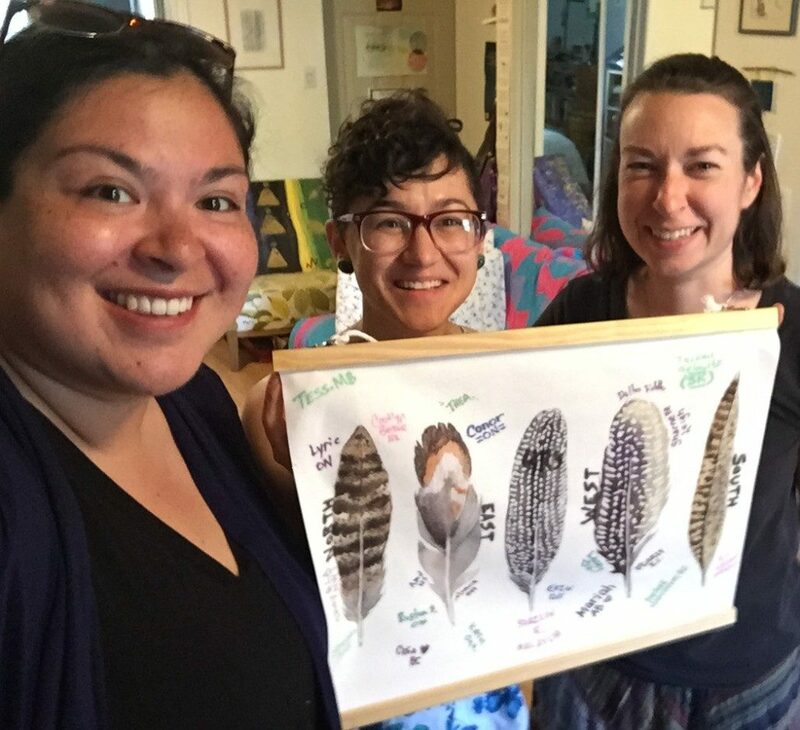 Like the three sisters, interconnected and well rooted, the work of reconciliation is a journey in being and expressing our whole selves, as well as a dance between past, present, and future, located between individuals, communities, and nations. Despite a history of systemic oppression and colonial violence, we must remember a longer chronicle of Indigenous brilliance and skill as we write our nowstory and generate our children and grandchildren’s some-day pasts. 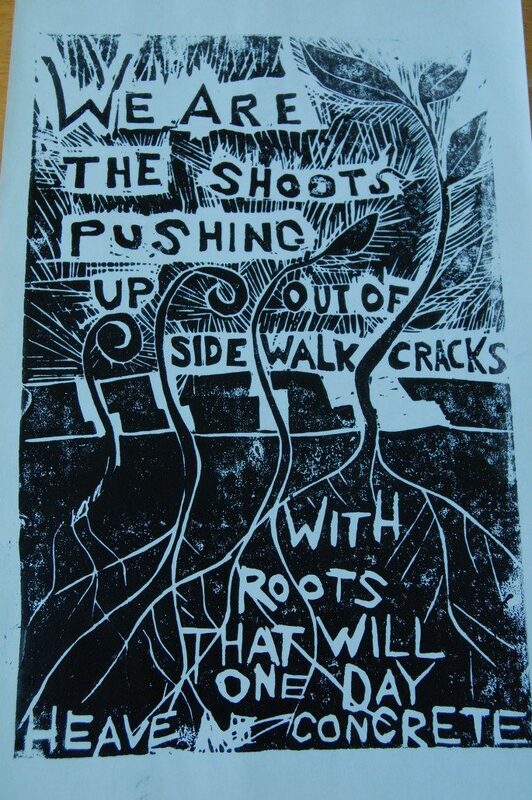 Head, heart, and hands together, our work is simultaneously about nourishing the soils, standing for the waters, tending the crops, saving the seeds, and cycling all back into the unending circle. Though the slow and steady growth of a healthy three sisters crop takes place upon the backdrop of immense and counterproductive forces of white supremacy, capitalism, antiquated legislation, corporate greed, and so much more, none of it is enough to suppress the energy, agency, and power building from Mi’kma’ki to Secwepemcul’ecw. As you can read, I get passionate about this metaphor, but I know that none of the conversation means much if it isn’t underpinned by real work. Like the three sisters, all of us in this struggle must spend time converting nutrients into growth. We must spend time with the earth, learn how to lean when we cannot stand, and stretch always toward the light. We must nourish our communities by the fruits of our labours, and remember that our time leads from the earth outward and back again, reminding us to be humble (humus – soil). We must strive to leave seeds for the future that are as diverse and vigorous as possible. We must build containers for transformation and systems change, for upturning rhetoric and imagining wildly wonderful futures that we can then build together. We must learn to speak in a language as old as time, which might mean casting off the distractions of our modern age to finally look one another in the eye, savour some slowness, and engage in a real conversation so that we can grow together in a good way. I bow to the brilliance of the three sisters as teachers in this work now more than ever.